My contribution this year to Lion Brand’s annual 12 Weeks of Christmas project series is the Baby Penguin Amigurumi using Baby Soft Boucle. It’s a project that works up quickly, and only uses 1 skein the Boucle yarn. 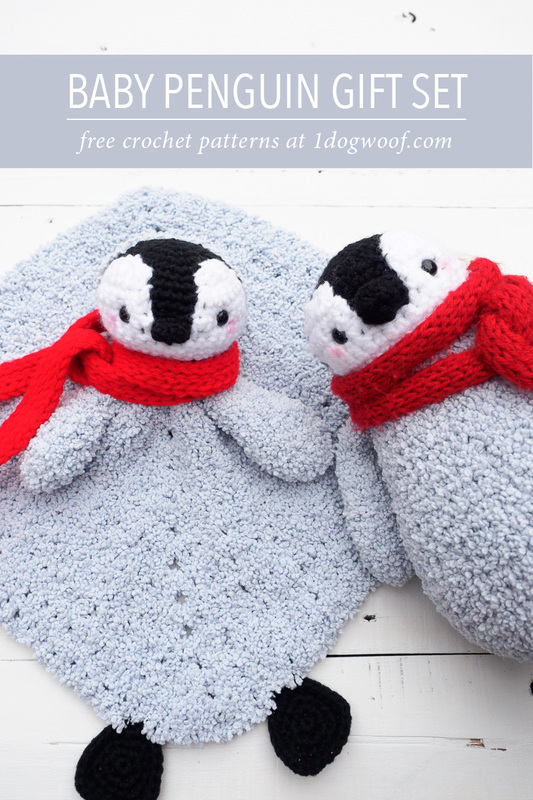 In Lion Brand’s crochet kit, they included another skein of Baby Soft Boucle and enough DIYarn to make two baby penguins. That makes it a great option for families like mine where everything needs to be identical or else my kids will fight over whose new toy is better. 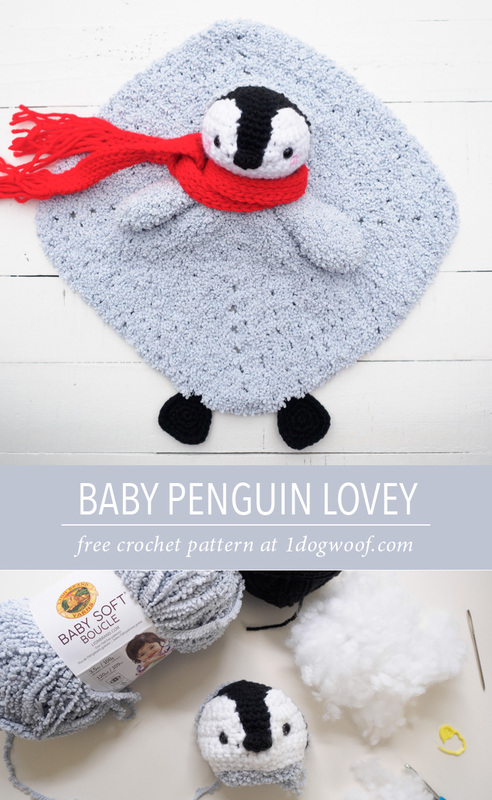 But if your kids have a better grasp of the concept that “fair doesn’t mean equal”, or if you’re looking for an adorable gift idea for winter baby showers, why not make a Baby Penguin Crochet Lovey for a perfectly penguiny gift set. 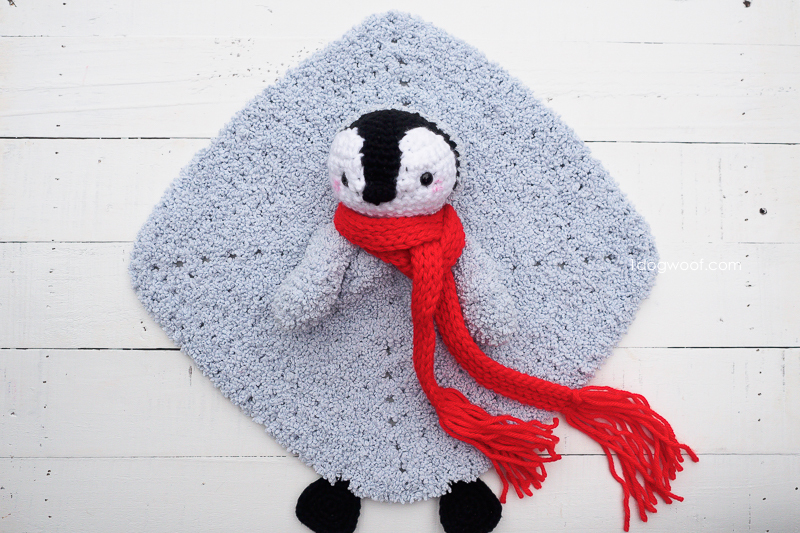 The penguin lovey is in many ways similar or identical to the stuffed toy, except for the obvious difference of the body. 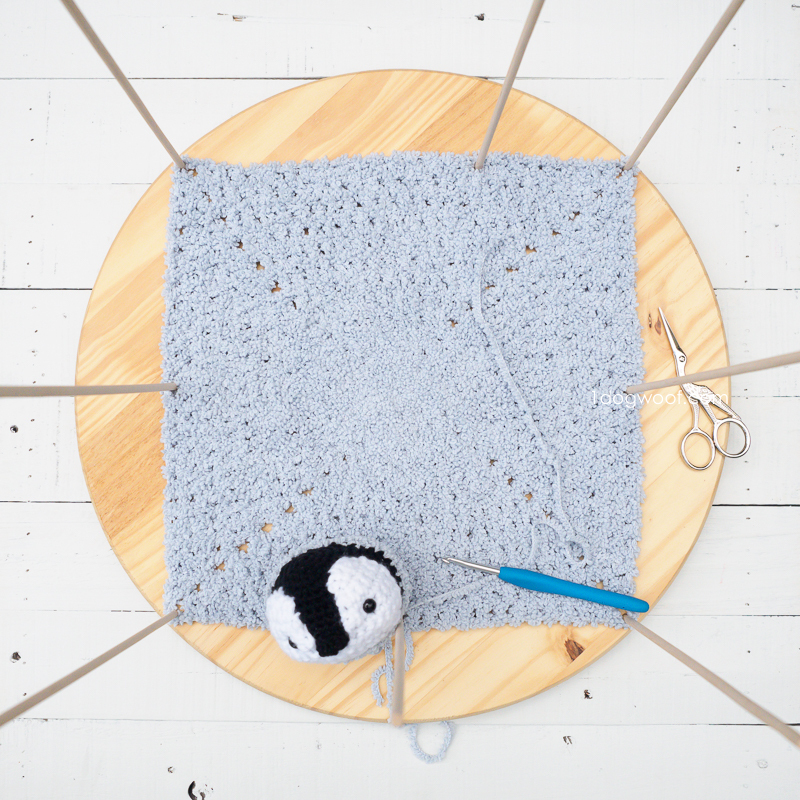 Instead of crocheting a plump, fluffy body for the penguin, you’ll make a fluffy granny square. There is enough yarn to make the square about 12 inches by 12 inches. 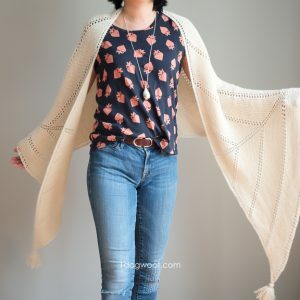 If you’re having trouble working with the Baby Soft Boucle, head over to my YouTube channel to check out my Baby Soft Boucle tutorial. It was made for my Stanley Duck Amigurumi, but the concept of working with 2 different stitch markers and feeling your stitches remains the same. 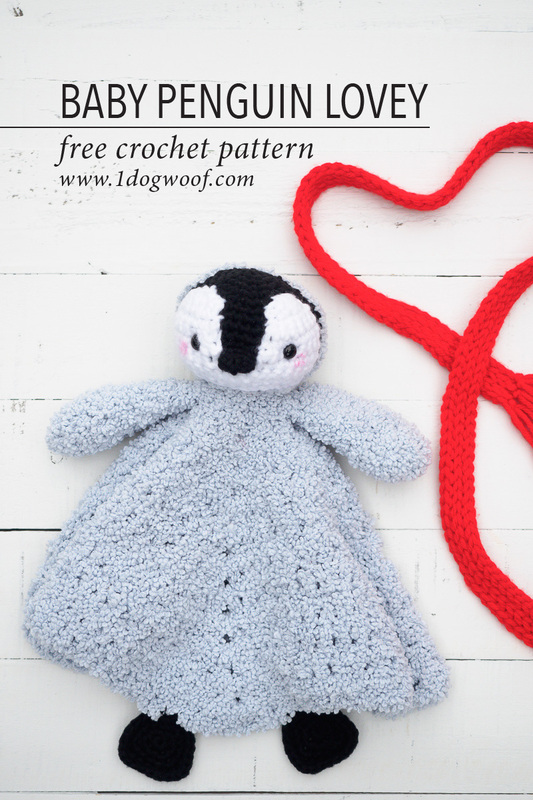 The penguin lovey head has some minor changes in the pattern, mostly so that the head can be closed up completely. 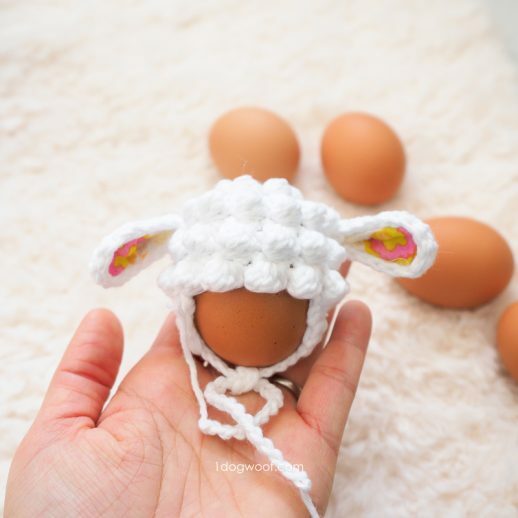 In the amigurumi version, the head is left open at the neck with 30 stitches around, and is joined directly to the body. 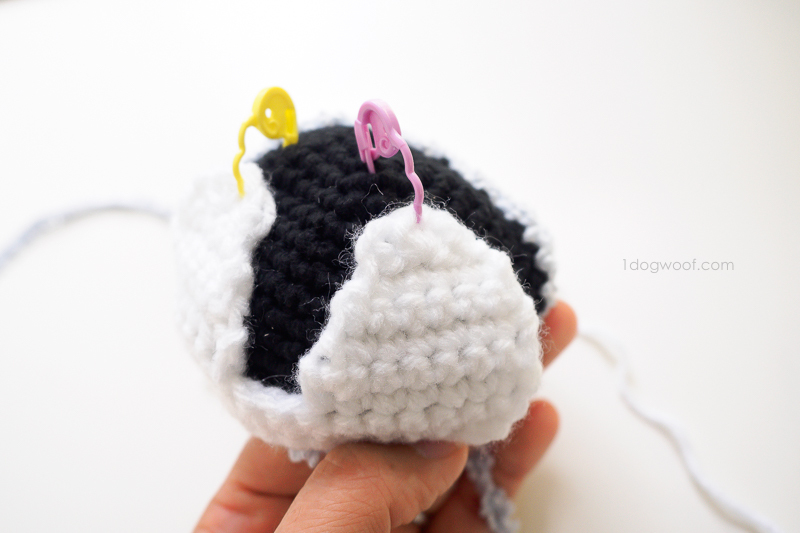 In the lovey, the head is closed up to make a solid ball, and then attached to the center of the granny square. However, the white face patch is the same in both. The lovey fins are slightly shorter than in the amigurumi version, so they don’t hang as far down on the lovey. Actually, you can choose not to add the fins at all, as many loveys don’t have the extra appendages. I personally like having the fin to hold on to, though. My daughter has loveys with no arms, and she tends to drag them around by the head. I’ve always been enamored with the image of a child dragging a much-loved stuffed friend, like Christopher Robin dragging Pooh Bear by the arms. The feet in both projects are identical, so no problems there. I had designed the feet flat for the amigurumi because you never really see a baby penguin’s feet – they’re always tucked under all that chubbiness. In this case, the design decision worked out well, because the flat feet become little taggies on the lovey, providing a bit of extra texture and tactile interest. Although the kit from Lion Brand includes the yarn for a second scarf, I don’t believe it’s necessary for the lovey. It doesn’t sit well on the lovey, and can be dangerous for infants. Actually, here’s a good time to remind everyone that these toys, whether it’s the stuffed toy or the lovey, should only be played with under adult supervision, especially if given to young children. The scarf especially should always be under the watchful eye of an adult and never given to children in bed. I trust my 5 year old with the penguin amigurumi, but she still doesn’t get to take the scarf to sleep. The Lion Brand Yarn Baby Penguin Amigurumi Crochet Kit sells for under $20, and even less when it’s on sale. 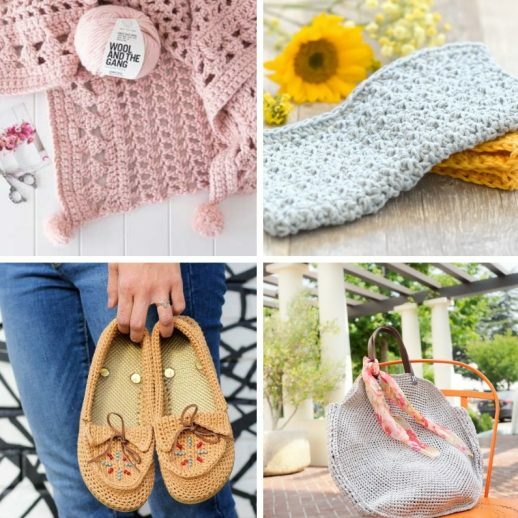 You’ll need a few other supplies, like polyester fiberfill and safety eyes, but if you already have those on hand, you can have an inexpensive yet gorgeous baby shower gift set, with the added bonus of it having been handmade with love. Add in a Penguin Wubbanub Pacifier for even more penguin goodness! 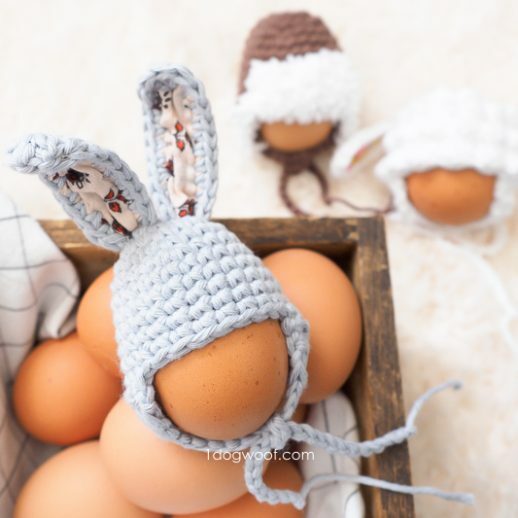 You can purchase the crochet kit directly from Lion Brand Yarn, and it comes with the yarn and a printed copy of the Baby Penguin Amigurumi pattern. You can also find both the amigurumi and lovey patterns in my pattern shops, individually or as a pattern bundle! For more baby gift ideas, you might like the Hedgehog Taggie Teether, a Goldfish Teether, or any of my other amigurumi patterns! 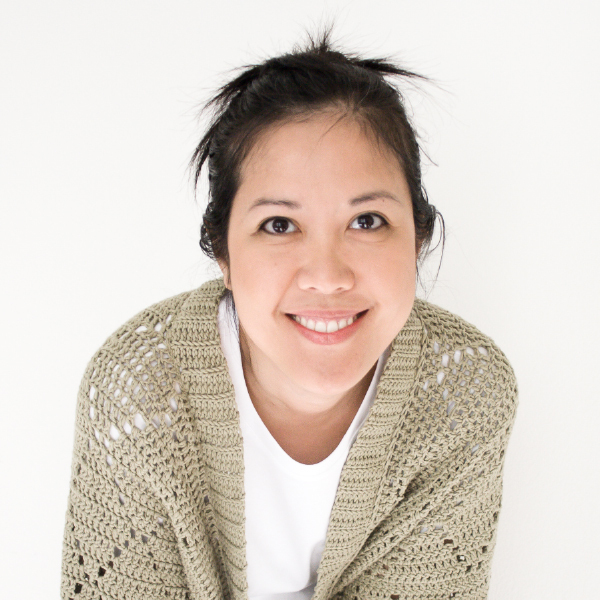 Granny square is blocked to 12″ by 12″. Gauge on granny square is approximately 8.5 sts in 4 inches. Weave in any black ends. Attach face to head, see directions for assembly below. Cut off the GRAY yarn, leaving a long tail for sewing to the body. Whip stitch through each remaining 6 stitches, pull tight to close. Secure with a knot. Squeeze round together to close the fin: Working through all 4 loops, work 3 sc across. Position the head in the center of the granny square, facing one of the corners of the square. 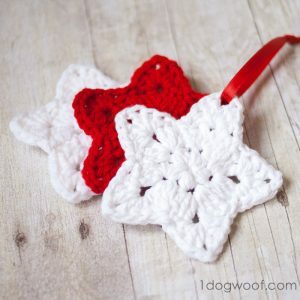 Use the tail from the head piece and sew to the granny square in a circle about 1.5″ to 2.0″ in diameter. Weave in ends. Align the fins on either side of the body, just under where the head joins the body. Position each feet so that the back corner of the triangle (where the join/tail is) is lined up approximately 1.5″ from the corner of the body that the head is facing. 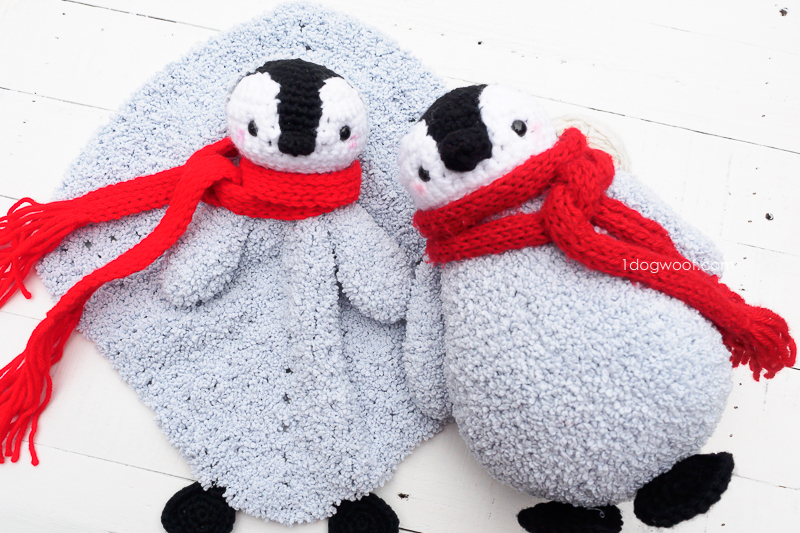 Will you be making individual penguins or gift sets this holiday season? 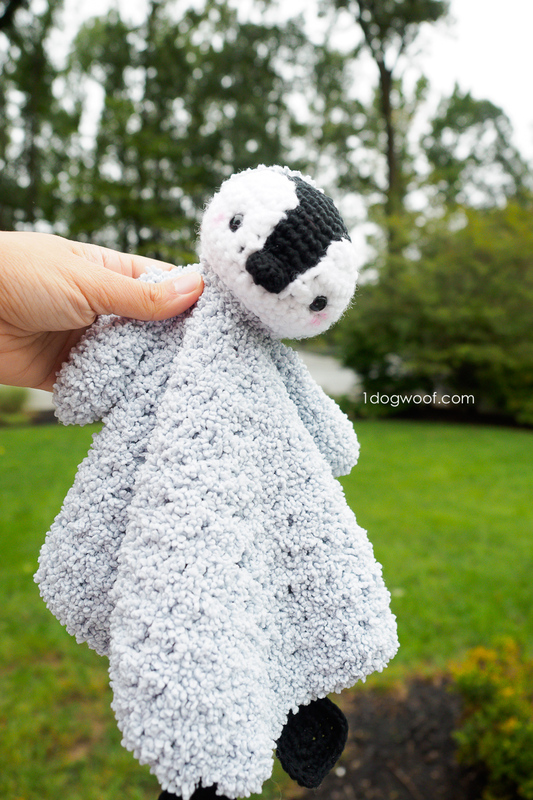 Be sure to snap a pic and share it with my on Instagram by tagging it with #1dogwoof and #babypenguinamigurumi. I can’t wait to see your penguin families! What a cool idea!! Thank you for sharing the tutorial! !